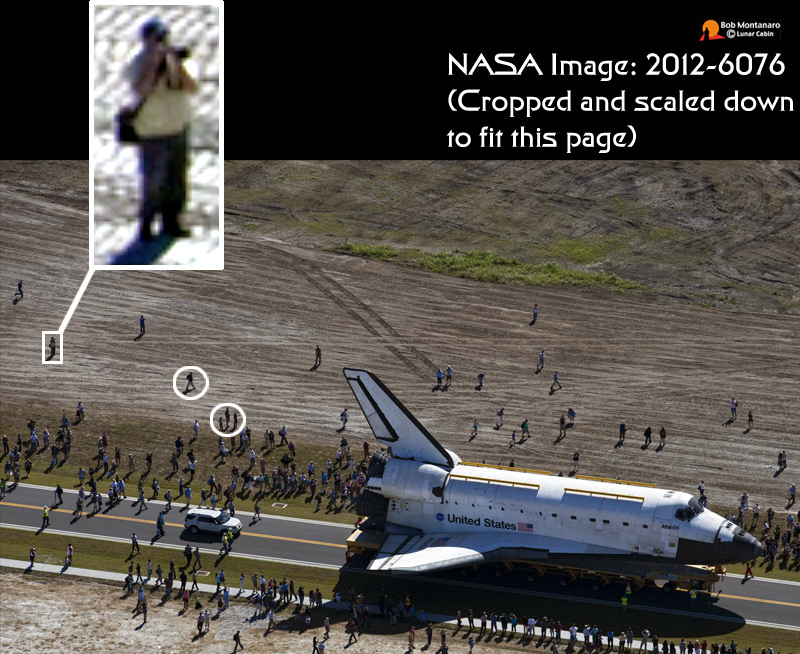 This is a rather fun picture that came to light when NASA released its own photographs of the Atlantis rollover. In at least four of their images I am visible with the one shown on this page being the best example. This still image was taken from the NASA TV helicopter that was continually orbiting overhead. To make it easier to understand I have put a box around where I am standing and then enlarged this detail of the image so I can be seen a little better though the resolution had to be stretched along with a bit of manipulation of the exposure to make it more comprehensible. The second image below is one of my images taken at almost the same time as the NASA image with a couple of corresponding features being noted. Below is my image taken from the ground at almost the same time as the NASA photographer was taking the image above. To connect the two images together note the people in the circles below that correspond with the circled people in the aerial image above. And finally, in the image below note the arrow that points out the position of the helicopter. The image below appears on Page Two of this series without annotation.